Oh glorious cabbage. I’ll spare the complaining, as I promised I would. As much as I may roll my eyes at the sight of it, the relentless supply of cabbage that has forced me to think creatively & outside the box, & I think that is a good thing. This is one of the reasons I love being a CSA member. My palette & repertoire have expanded so much. And for as much as I him & haw, I’ve actually made some surprisingly satisfying cabbage recipes of late. Does this mean I’ll be sad to see it go? Absolutely not! 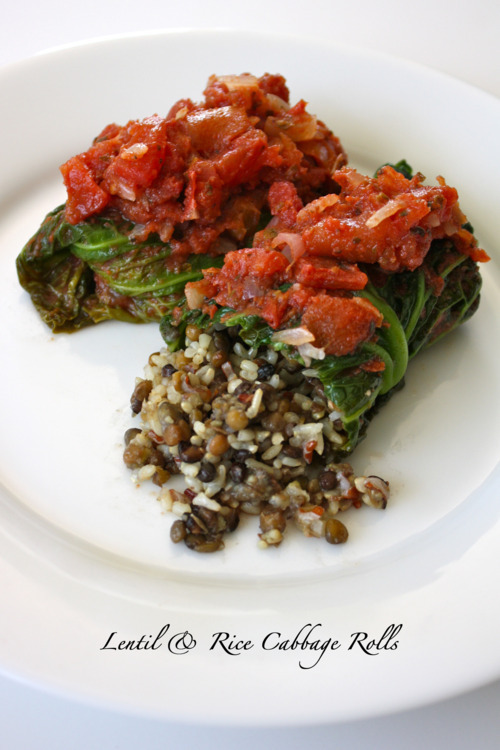 But next season, when the cabbage starts rolling in, I’ll have a list of go-to recipes, & these “Lentil & Rice Cabbage Rolls” will be one of them. Half of my savoy cabbage was used in a batch of my favorite coleslaw, which I will be sharing with you soon. The other half has been sitting in the cripser awaiting it’s demise. I pick up my next share tomorrow, so tonight I was in clean out the fridge mode. It’s been a bit warm for soup, so I thought about juicing it, but then something else sprang to mind – “cabbage rolls.” I’m not quite sure where the initial idea came from, but I must’ve seen it somewhere. Perhaps while browsing for St. Paddy’s Day recipes? A little more browsing around & found a ton of recipes, that I adapted into a quick & easy version. I’ve had a long day, & there is nothing I wanted more than a quick dinner & a good night’s sleep (I want to be fresh for the Dalai Lama tomorrow), & with a few staples, I was able to get dinner ready & in front of me in about 30 minutes. 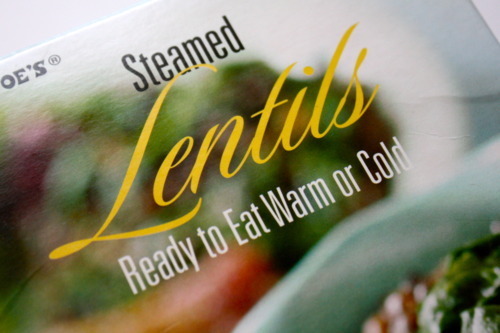 I love these read-to-eat steamed lentils from Trader Joe’s. The recipe possibilities are endless. A simple & favorite way to prepare these are with some streamed greens, rice, & a drizzle of balsamic vinegar. Anna makes a wonderful salad using these & marinated beets. Another TJ’s item I always have on hand is the frozen medley of black barley, & red & brown rice. Steam for 3 minutes & it’s done. Thanks to these two, dinner was a snap. Heat oven to 350F. Bring a pot of water to a boil. 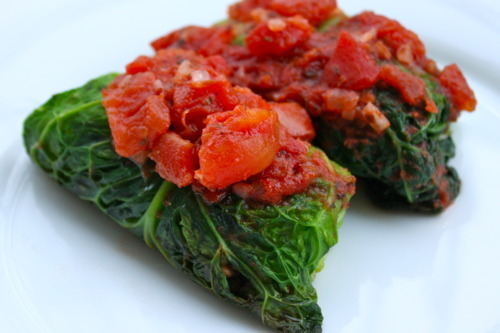 Cook cabbage leaves until they have softened slightly, about 2 minutes. Remove from the water, drain & set aside. Dry cabbage leaves & lay flat on a cutting board. Mix the lentils & rice with sea salt & pepper to taste. Divide the mixture among the cabbage leaves, spooning it onto the thick bottom of the leaf. Roll the leaf over once, fold in the two sides & continue rolling. Repeat with the remaining lentil mixture & cabbage leaves. Place the rolls seam side down in a small casserole dish. Cover with tomato sauce. 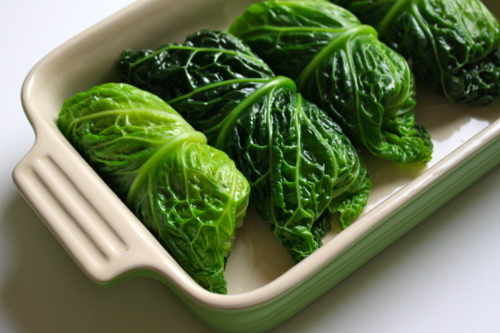 Bake until the cabbage is cooked and the rolls are heated through – about 20 minutes. 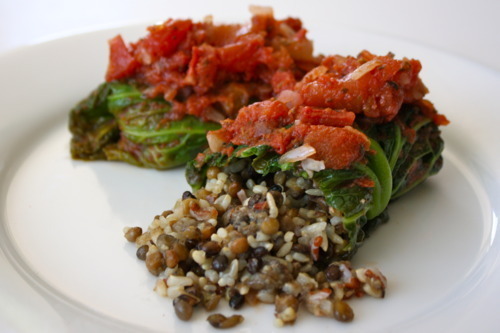 Tender rice & lentils enveloped in cabbage leaves, smothered in a sweet tomato sauce. I was surprised at how good these were. Yet another cabbage success. Enjoy!